The Israeli broadcaster IBA has made a huge national contest, taken the prototype of the Swedish Melodifestivalen with three semi finals and a second chance show. The national final has been held in Jerusalem on the 7th, March this year. Out of ten finalists Moran Mazor could convince the Israeli public and televoters. 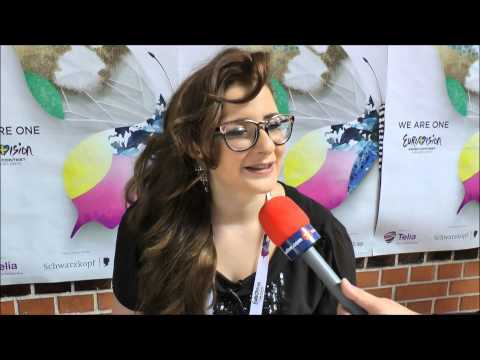 Moran Mazor is 21 years old and was born in Holon, a suburb of Tel Aviv. Her parents originally come from Georgia and have immigrated in Israel 40 years ago. As a child Moran started to sing and learned to play the piano. She has been participating in the reality show “Eyal Golan calls you” and won it. Together with Eyal she has been touring throughout Israel and she is now working on her first album. With her participation and victory at the Kdam festival (Israeli national final) a dream came true to represent Israel at the Eurovision Song Contest in Malmö. The song “Rak Bishvilo” which means “Only For Him” is a melancholic ballad sung in a very dedicated and emotional way. Maybe this song is a bit too complicated to convince by first hearing. Nevertheless Moran’s gorgeous voice and striking look with very cool glasses will give her a lot of attention. Let’s see if Moran can break the spell, as Israel did not make into the final for the last two years. 12 points from Georgia may be granted! For Israel it’s the 36th time being part in the Eurovision Song Contest. The first Israeli entry “Ey-sham” by Ilanit made a respectable 4th place in 1973. Since Israel joined the ESC family it became one of the most successful countries with many strong and outstanding songs. Three times Israel has won the ESC: “A-ba-ni-bi” by Izhar Cohen and the Alphebeta in 1978, “Hallelujah” by Gali Atari & Milk and Honey in 1979 and “Diva” by Dana International in 1998. There were a lot of good songs with big singers which came close to victory like “Hora” by Avi Toledano in 1982 (2nd), “Hi” by Ofra Haza in 1983 (2nd) and “Kan” by Duo Datz in 1991 (3rd). Israel is also popular for great choreographies, especially in the 80’s and 90’s formation dance was strongly used in the Israeli contributions and has been mimicked from other countries, but not as successfully. The contest is enjoying a great interest in Israel and has huge viewing figures. Due to the introduction of the semi finals in 2004, Israel is not always among the finalists, out of 9 times, Israel could qualify five times.